To fully understand the proper tactics to employ, you must have a complete understanding of the system. Aggressor(Threat) Aircraft are the biggest threat in a combat situation. PVO Interceptors are capable of firing ordnance from all ranges. At Beyound Visual Range(BVR)they can fire Long & Medium-Range missiles under GCI control, at Within Visual Range(WVR) they can engage you with Short Range high off boresight IR guided missiles, and then close in to engage with you with cannon(if so armed). Surface to Air missiles can engage with you in only specific circumstances, unlike aircraft they cannot maneuver to place you in the section of the highest Pk (Probability of Kill). The Surface to Ait missile site requires you to fly within its range and within its engagement envelope. This means that although the SAMS are a big threat, Enemy Combat Aircraft should always take precedence over them in your task prioritization. Anti-Aircraft Artillery is nearly as deadly as SAMs. This short range method of Air Defence is one of the enemy's most lethal. With other methods of Air Defence, you can maneuver to defeat the missiles fired at you, or jink to evade the cannons fired by another aircraft. I hear you all say you can jink against AAA as well, yes that's true, you can, but when you consider the rate of fire of a ZSU-23-4 coupled with the cohesive fire of all the guns of the air defense unit being deployed, the jink capabilites are much reduced. Now also compare it to an aircrafts gun. Three dimensional geometry of the firing platform adds to the reduced accuracy. Not only that, but the shells of the AAA are much bigger and use fragmentation rather than the contact type of fusing. Also the geometry in relation from the fixed gun position to your aircraft makes the guns solution much simplified for the AAA emplacement. There are many attributes to an effective air defence network. The most important of these are Connectivity, Synchronisation, and Systems Redundancy. As most of you will know, the modern battlefield is all connected via the C3+1(or simply C4 - Pronounced C-Cubed plus) net (Command, Control, Communication and Computers). This system has been developed and improved upon by the Soviets/Russians from experiences in Vietnam and the Middle East Wars. Connectivity is simply that the whole of the IADS shares information with each other in an organised way through the chain of command. Virtually all of the air defence systems, both IR and Radar are included in the net. Although individual units (Battalions) are capable of independent operation. Synchronisation means that the IADS co-ordinates each of its assets to engage the threat. Redundancy has a two-fold meaning in the IADS. One meaning is that the various systems back each other up, or for example the SA-3's are placed within the lethal envelope of the larger SA2 to give low altitude coverage to that SAM System, which is inturn placed within the envelope of the larger High altitude SA-5 system. This means that no matter where the threat aircraft is it can be engaged with maximum Pk. Lets take a quick look at a typical scenario so you can see how this works. A flight of Two high flying enemy aircraft are detected inbound by the early warning radar station, but have not yet reached the engagement zone of the forward Air Defences (MSAM) (See diagram). This information is passed to the SOC (Sector Operations Control) in the C4 net (Connectivity in Operation). The SOC decides that these aircraft will become a threat in the near future and orders the EW radar to maintain a track on the flight. At the same time the SOC sends the data it has received to the ADOC (Area Defence Operations Control) which is the National or theatre Headquarters for all operations. The enemy flight gets to the outer range of the MSAM defences, the EW radar passes this info to SOC, the SOC organises and orders the relevant actions, based upon the resources it has. The SOC decides that a Missile based engagement is required, and passes the required information (speed, altitude, heading, location) to the SAM Brigade HQ that will engage the bandit, (an example of Synchronisation). The SAM Brigade HQ will track the target on its Long Track radars. The SAM Brigade liases with the EW radar to build up a picture of what the target is doing. Also during this time, the SOC has kept the ADOC informed as well as the other Air Defence units in the region that might be called up to engage the threat aircraft. 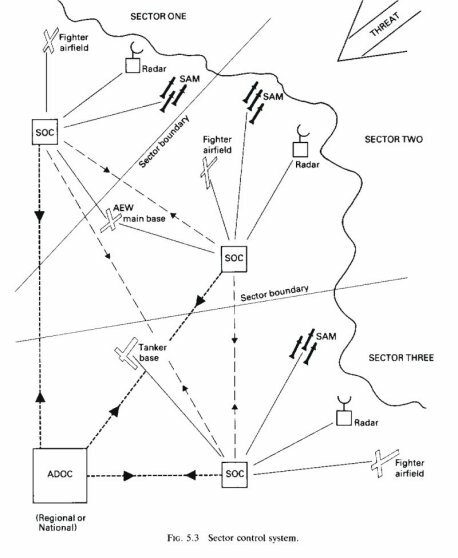 When the enemy flight enters the WEZ of a SAM Battalion (5 of which usually make make up a Brigade) then the Brigade passes the information to the in-range battalion and lets it take over with its own guidance radar. Lets take this as an SA-5 Battalion. The Long track radar passes the info to the Battalions BarLock-B radar, which then tracks the flight until missile launch, at which point the Battalions Square Pair radar guides the missile to the target via semi-active radar guidance (See chapter 7 in the Falcon manual for an explanation of the various methods of Guidance). Once the SA-5 missile is within 10 miles of the targets its own internal Active Radar Homing(ARH) is engaged for final guidance to the target. At this point, two things could happen, the flight could be destroyed, or the flight could evade. Lets say the flight has evaded the missiles, and has proceeded to become a low-level flight to evade the medium-high altitude, long range air defences (MSAM). The flight has penetrated the outer 'belt' of defences. The IADS SOC has already passed information to the other defences in the vicinity, so they are prepared and are looking for the target. A group of Air Defence Soldiers on their way to the FLOT engages the flight as a Target of Opportunity using SA-7;s, the flight however survives. This engagement is reported to the SOC, who have another fix on the targets heading and position. 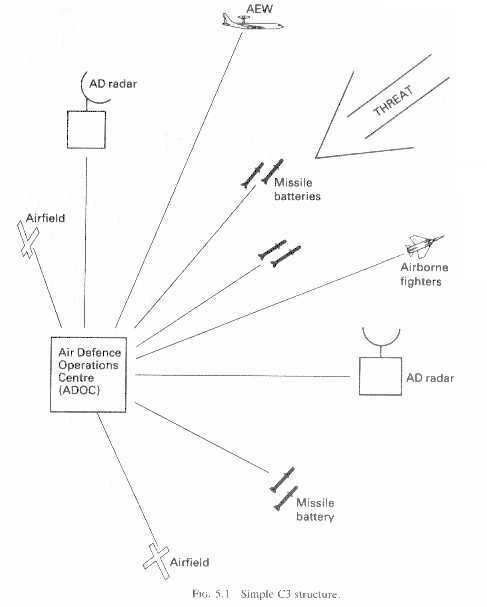 This information is used to plot possible targets, and SHORADS (Short-Range Air Defence Systems, See above diagram) at the possible targets are informed. The flight was also identified by the SA-7 squad as a two Ship F-4G flight. This means that the flight is most likely on a SEAD Strike. The SOC orders the Long range radars to keep track, whilst the individual Brigade and battalion systems keep their radar emmissions to a minimum(EMCON). 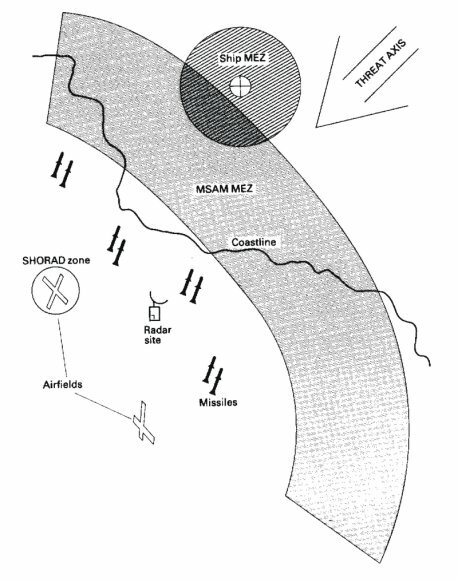 A search radar at an Airbase detects an incoming flight, and pass this information through the net to the SOC, and the SHORADS at the airbase, (the SA-3 at the airbase) picks the flight up on its Low Blow tracking radar, but the F-4G's have already launched a HARM, and the SA-3 site is shutdown, but due to the collocation of the AAA at the Airbase, the IADS is still able to prosecute an attack on the flight. (an example of redundancy). The Radar at the Airbase is also targeted and shutdown. The AAA at the base switch to their visual systems and inform the SOC they have done so, the F-4G's don't get any indication of the AAA at the Airbase, but the EW radar, that first picked them up(usually an AWACs or GCI type platform, is still showing up, but is not an immediate threat to the F-4G flight. The AAA at the base is kept up-to-date on the ingressing flight via the C4 net from SOC. The aircraft are acquired visually, and when within engagement range, the AAA turn on their aiming radar, which gives them a much larger Pk. The two inbound F-4G's don't have time to react before they are destroyed by a combination of older barrage fire from the ZSU-57's and aimed fire from the ZSU-23-4's. The threat is destroyed. During the whole of this time, from detection to destruction could be a matter of 10-15 minutes. Thus you have seen an IADS engagement from start to finish, the flight here was caught by an Ambush tactic employed by the AAA. Now we will discuss the proper Air Tactics to enable the maximum benefit from these assets. You as the Aggressor Pilot will always be in the advantage over your attacking opponent. To Successfully defeat the attackers you must use all possible assets to assist you in his destruction. Therefore you MUST keep Situational Awareness of your Exact Location in relation to the IADS system and its resources. Whenever possible "drag" the attacker into the SAM defense envelope or Force them into the WEZ of the AAA Gun positions. You do not have to personally obtain the "kill" to fulfill your mission. As NVAF Pilots in the Vietnam War soon discovered, all you need to do to defeat your enemy is to disrupt his attack. Forcing him to evade or jettison his weapons before target release will be just as effective as a kill. This can be best accomplished by using the IADS to your advantage. Maintain a Strong Formation and allow AWACs/GCI/IADS to guide you to proper position in order for you to maximize the full potential of the entire IADS and all its weapons.